Really? 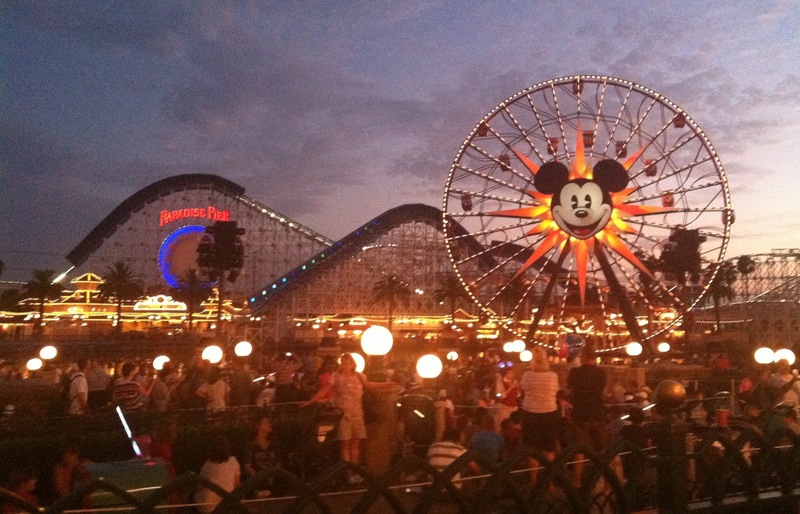 Disneyland Resort Without Kids? My husband turned his back on Disneyland. It didn’t matter that Disneyland was where we went on our very first date or was where we celebrated together our high school “Grad Night.” It didn’t matter that we commemorated our first wedding anniversary there. Apparently, none of our fabulous Disney family memories mattered either. Taking each of our children to Disneyland when they were two for their first experience. The numerous (too many to count) return visits. Christmas season visits to enjoy the holiday spirit. The opening of Disney California Adventure. According to him, Disneyland was something you did when your kids were growing up. When they were old enough to start going by themselves, Disneyland became a done deal for him. I’ve tried to convince him that we could still enjoy the Disney Resort experience without kids, but he didn’t see the point. What possibly could Disneyland offer to some empty nesters? He could not be swayed otherwise. That is, until I went to evo12 and met the friendly Disneyland public relations representatives. Of course, they wholeheartedly agreed with me; Disneyland has a place for all kinds of demographics. They sensed my complete and utter exasperation on the matter and wanted to help me out. They kindly offered to assist me in my quest of getting my husband to change his “no kids -no Disneyland” perspective. They provided us with two, one- day hopper passes to the Magic Kingdom in hopes that my husband could rediscover his Disney magic from an empty nester point of view. 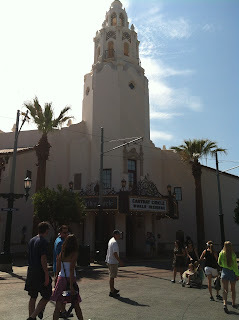 Our first stop was Disney California Adventure as it had just newly reopened in June. The entire park got a face lift, being transformed in to an “original Mickey” theme, replicating what Los Angeles looked like in 1923 when Walt Disney first came to town. In addition, California Adventure had also added a new land, Cars Land, named and designed for the highly successful animated movies, Cars. we bee-lined it to the back of the park where Cars Land was located. As in true Disney fashion, every minute detail from the Cars movie and Historic Route 66 were carefully recreated. It was simply remarkable to see it all in “real life.” We were in awe of the authenticity that surrounded us. The flagship attraction in Cars Land is Radiator Springs Racers. We had tried to get fast passes for the ride when we first arrived at the park, but were informed that they were already gone for the day. An obvious indication of how popular the ride was and how crowded it was going to be. Sure enough, when we got to the entrance, a sign was posted saying the wait time was 1-1/2 hours which in reality meant more like two hours. Gone are the days for my husband that anything was worth waiting in line for two hours. Besides, we had a lunch reservation in an hour. What were we to do? Well, I also happened to notice at the entrance that there was another sign that pointed to another line for the ride, a single rider lane. Single rider lane meant anyone in that line agreed to take whatever single seat was available when they reached the front. You traded a shorter wait time for not being guaranteed to ride with the people from your party. The wait time for that lane was 20 minutes. It took us exactly two seconds to decide that after 31 years of marriage, who cared if we sat in the same car or not. Thus, down the single rider lane we headed. During our short wait in line, I got to chatting with two other very obvious empty nester couples. Tony and Cindy were from Tennessee. I asked them what they thought about going to Disneyland without kids. They loved being able to eat when and where they wanted to and to have the flexibility on how to spend their day ( as opposed to always doing what the youngest members in their party wanted). They said they always try to use the single rider lane whenever possible as it really cuts down on the waiting in long lines. Their favorite couple ride? Soarin’ Over California. Another empty nester couple waiting in the single rider lane with us were Teri and Jeff from Upland, California. Because they live less than an hour away from the resort, they had purchased annual passports. This enables them to visit the resort at least once or twice a month. They’ll ride a few rides than head home. No need to pack it all in in one day. They never go on weekends or holidays so they can avoid the crowds. They both agreed that they have a lot more fun without children, especially since they don’t have to worry about anyone else but themselves. Their favorite rides as empty nesters? California Screamin’ and Soarin’ Over California in Disney California Adventure and in Disneyland, Pirates of the Caribbean, Space Mountain and Indiana Jones. When we got to the front of the line, my husband and I actually ended up being in the same car. He was in the front and I was in the back. We shared the car with a young family from New Zealand. We were able to observe children getting all excited about the ride minus the responsibility of monitoring them. As for the highly touted attraction? It lived up to all the hype we had heard. Very fun. And so worth our shortened wait!! We had made reservations to eat lunch at one of the many outstanding restaurants in Disney California Adventure, Storyteller’s Cafe, assuring us a comfortable yet casual place to eat, away from the hustle bustle of the park. 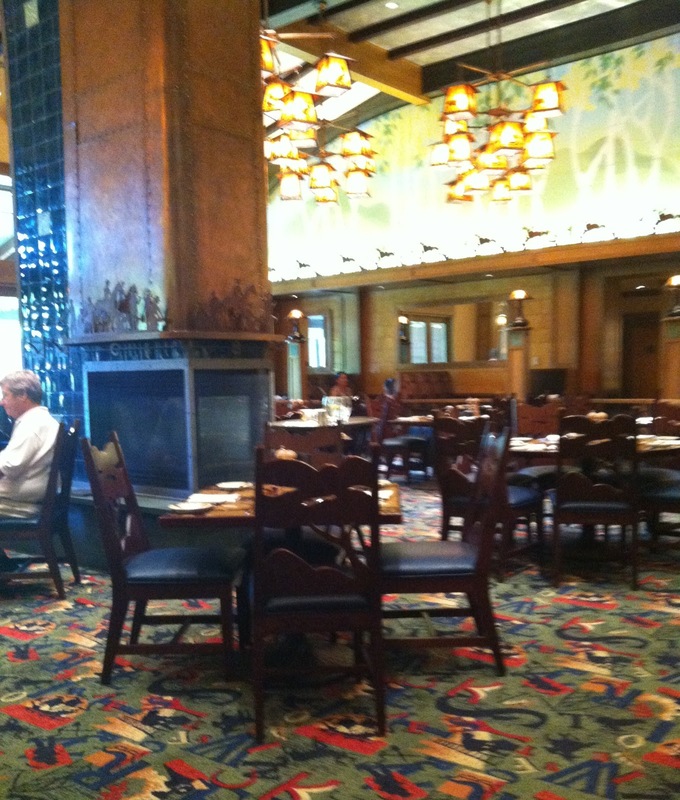 The atmosphere was cozy and warm, resembling a fancy hunting lodge. Huge murals of storybook characters lined the tall walls. The food was beautifully presented and delicious. The service extremely accommodating. We never had considered doing something like this when we had brought children along. After lunch, it was back to the attractions. We went to Soarin over California next, one of our favorites and apparently the favorite of other empty nesters as well. While waiting in this line, I struck up a conversation with another empty nester couple, Jenny and Dean from Bakersfield,California. They try to come down to the Disneyland Resort once or twice a year. Dean is retired military and so they take advantage of discounted military tickets. Why do they like coming to Disneyland without children? Because they get to do what they want to do and not have to keep up with a breakneck pace. Both Jenny and Dean rode electric scooters. I asked them if being on scooters gave them any added perks within the park. While they said that they no longer get special privileges like being able to go to the front of the line because of their handicap status, they do appreciate how the park is set up so that it is not inconvenient to maneuver the scooters around. Jenny and Dean’s favorite empty nester rides? You guessed it….Soarin’ Over California. They also really like Buzz Lightyear, in Disneyland, even without kids!!! We went on five rides in Disney California Adventure before we required a brief hydration/rest break. We plopped ourselves down on some benches right in the middle of Cars Land for about 30 minutes, thoroughly enjoying the entertaining people watching. Rejuvenated, we headed over to Disneyland. We were surprised how tame this park was compared to Disney California Adventure. There were relatively few crowds and the lines were minimal. It didn’t take long at all to zip through our favorite and familiar rides of our past such as Star Tours, Thunder Mountain, and Pirates of the Caribbean. After, we took another brief respite along Main Street, having a snack on the patio of the Carnation Cafe while watching the Mickey Parade. To end our day, we criss-crossed back to Disney California Adventure so that we could see the show, World of Color. While hard to describe, I’ve had tons of friends tell me this was a show you didn’t want to miss. The Disney people had arranged for us to view the show from a VIP section where we could sit and take in every aspect of this visual delight. All I can say, after now viewing it myself, is, “WOW.” Truly an incredible program to behold. When it was all over, if we had had children with us, I’m sure we would have had to deal with their crankiness and tiredness, trying to get them quickly to the car. But being just the two of us, there was no need to rush away. Instead, we just sat and reminisced about the highlights of the show until the crowd was dispersed. Then, we leisurely made our way to the tram for the ride back to the parking structure. How did this empty nester day compare to our past visits with children? For one, we definitely took it slower (rest periods were semi-frequent and much appreciated). We didn’t go on as many rides (but we certainly did ride everything we wanted). And we ate a lot healthier and slower (we weren’t tempted by all the sugary snacks that kids beg for on the run to the next big attraction). I know you are dying to know: What were my husband’s thoughts after our empty nester experience? Did he change his no more Disneyland outlook? In the middle of our day, he confessed to me that Disneyland wasn’t the problem. Rather, it was how his older body reacts to the Disney experience. Standing in long lines causes his back to ache and his feet to hurt more than in earlier times. After accommodating his day to a “sans kid” schedule, he found he could manage his ailments and have a really fun day too. He was really impressed by the look and feel of the new Disney California Adventure. And he couldn’t stop talking about how fabulous World of Color was. Thanks to the public relations department at Disneyland Resort, we discovered first hand that Disneyland does indeed provide a wonderful, empty nester experience. Really? Doing Disneyland without kids? You bet. Have you given the Disney Resorts a try without kids? What was your experience?